Nokia 600 features 3.2" capacitive TFT touchscreen display with 640 x 360pixel resolution powered by 1GHz processor with 2D/3D Graphics H/W Acceleration and runs on the latest Symbian Belle OS. It has 512MB RAM. It sports 5 megapixel rear camera with LED Flash capable of 720p HD video recording and comes with 2GB of storage which can be further expandable upto 32GB. 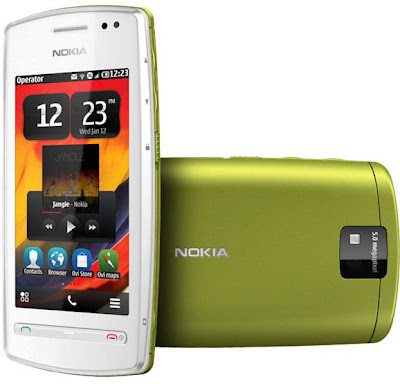 Network connectivity options of Nokia 600 includes pentaband 3G(HSDPA Cat 10 @14.4 Mbps, HSUPA Cat 6 @ 5.76 Mbps), WLAN 802.11 b/g, Bluetooth 3.0, GPS with A_GPS support. Expansion options includes MicroSD card slot, micro USB slot, TV-out. Sensor options includes ambient light sensor, proximity sensors, magnetometer, accelerometer. Color options includes Black, White, Pink and Lime. Other options includes Integrated NFC Chips, Stereo FM radio, Social networking apps. It comes with 1200mAh standard battery which provides a talktime of 15.5hrs @2G, 6.5hrs @3G and has standby of 23 days. It comes with a dimension of 111 x 53 x 13mm and weighs 100gms. Nokia 600 will be out from Q3 for around €180/$260 unlocked version. Tags:Nokia 600, Nokia 600 features, Nokia 600 specifications, Nokia 600 review, Nokia 600 details, Nokia 600 availability, Nokia 600 specs, Nokia 600 images, Nokia 600 pics, Nokia 600 pictures, Nokia 600 imgs, smartphones, Symbian Belle OS smartphones, Nokia 600 Network options, Nokia 600 Expansion options, Nokia 600 multimedia features, Nokia 600 Sensor options, Nokia 600 price, Nokia 600 cost.